Learn keyboard shortcuts for the computer programs you use regularly. The time you save will really add up. Limit how many times a day you check social media, news, etc. Otherwise, leave them alone (seriously). chamber in The Big Book of Chamber Ideas. Schedule specific times of day to check email. This seriously improves productivity. Read and respond, then close your email program. By having different email accounts, you can avoid answering personal emails at work and work emails at home. When you’re overwhelmed and don’t know where to start, put tasks into two categories: critical and important. Finish the critical items and then tackle things that are important. Save time by putting together tomorrow’s game plan today. Before you leave, arrange the details of your day. This way, you can easily prioritize and schedule, which allows you to work more efficiently. 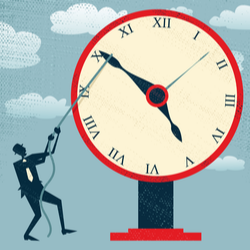 You have a work start time, but do you really have a leaving time? If you schedule to leave the office at a specific time, you’re more likely to stay on task and be more productive. Manage your organization with ChamberMaster. It’s easy-to-use and designed to manage all the day-to-day operations of your organization. for a detailed checklist of important factors to consider.